Allergy is a harmful, misguided and over-zealous immune response to antigens that causes tissue damage and disease. It is a form of hypersensitivity, which can be classified into four types, based on the immune reactant, the antigen type and the effector mechanism (Table 1): it can be considered as a type of autoimmunity. An extreme example of allergy is anaphylaxis. Antigens that can induce an allergic response are called allergens, and they are often derived from non-infectious or non-microbial sources. There is no single unique structural motif (or family of motifs) that define a protein as being allergenic, but commonly they are small, soluble, stable and can have peptidase activity. Due to the structural similarities of some (unrelated) proteins an individual who is allergic to one protein may be allergic to another protein from very different species e.g. Latex, kiwi and birch pollen allergies are linked. Table 1: Types of hypersensitivity reaction. Hypersensitivity is defined by three factors, the immune reactant, the antigen type, and the effector. Sensitisation to allergy. Sensitisation to allergy is a form of immune memory priming. Both T- and B cellsneed to be primed to cognate antigen (in this case the allergen). The factors that cause an allergic response are not fully understood, but the environment, the site and the type of antigen presenting cell are critical to the outcome. A skewing of the response towards T helper 2 (Th2) is also critical. Allergic responses have two phases: the acute and the chronic, observed as Wheal and Flare. This generally occurs rapidly after allergen exposure (<1hour). It is caused by the degranulation of mast cells and the release of histamine and other mediators. Histamine causes local inflammation and the symptoms of an ‘allergic attack’, acute local redness and swelling. 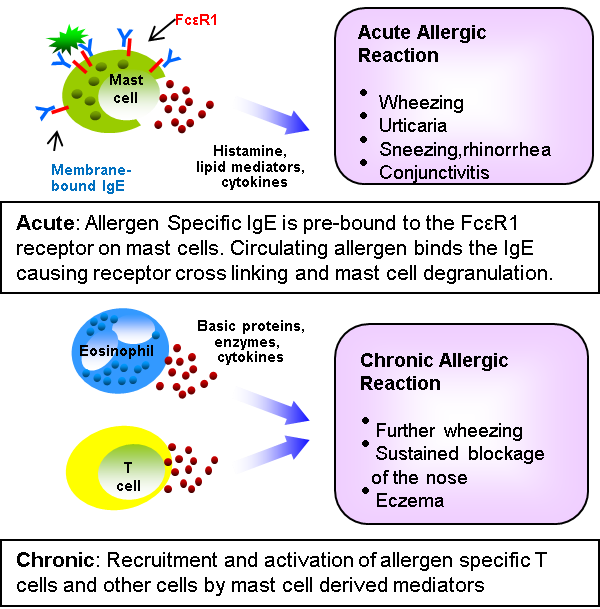 Mast-cell degranulation is caused by the binding of allergen to IgE (pre-bound to FcεR1 receptors on the mast-cell surface). Since IgE is pre-bound, this reaction is very rapid in onset. This generally occurs within 6-12 hours of the initial allergen exposure. It is the cellular response and is caused by the recruitment of T cells, eosinophils and more mast cells to the point of exposure. These cells once recruited release enzymes, toxic proteins and more cytokines leading to more inflammation.